We do landscape architecture to make places that work. But in valuing works of landscape architecture – distributing awards and attention – our actions show that we value the design above and beyond the resulting site. Why do we think of the life of a project as its afterlife? This seems to come down to four tendencies. First, the practitioner elevates the design, and not the site, as something that can hover above the everyday of phone calls, emails, driving, airports. It gives a lodestone through all of this negotiation and toward success of the finished site – the design is, among other things, a sign that stands in for the bundle of experience and value that the site will hopefully create. But as it diverges from the original design, becoming realized as an inhabitable body, the site gains an uncomfortable autonomy – it is no longer fully the design project. The design dies in the completed body. Second, there is a gulf between designer and users as to how a project fulfills their desires. The majority of users want the site to execute programs; it is defined by what can be done within it on a continuing basis. Past the moment when the designer is selling their own conception over another’s, this want does not match up well with the designer’s ability to incarnate a special place, with a personality. This basic want for program, that is, does not acknowledge the designer’s belief, which is that this very personality is the crucial thing that the designer has contributed to such a project. The public want for program, moreover, does not match up with the designer’s knowledge that what the designer imbues in the project is precisely the unsayable, bound up in art school talk about negative space, spatial relations, spatial dynamics. Otherwise, the designer knows, an engineer might as well come in and pack the space with swings and tennis courts. In great successes, artistic successes, civic successes, professional successes, the site physically and spiritually resembles the design; it ends up living the life that was intended for it, and is a continuing source of pride for the designer. In such cases, space has successfully done the work of enchanting the assemblage of materials. Otherwise, there is only a scribble on the ground that skirts around the splash pad; and the muddling forward of the site and its visitors is something of no concern to the parent who has forgotten it. 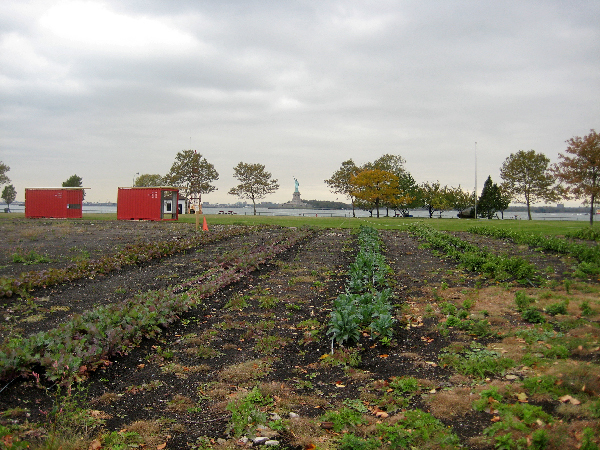 Governors Island in a bardo, 2009. Third, there is a minority group of users and designers who invest in a symbolic economy of projects that maps onto that for art objects – a game of propositions that can be used as symbolic tokens, standing in the short term for a play of significance, and then ultimately for prestige. As each such token enters into life as a site, its autonomy and clarity is muddied. But the original design, bound up in renderings and programmatic statements, can stay on the board as another counter in the prestige game. Fourth, and finally, and most fundamentally, consider the labor position of the landscape architect. The landscape architect’s role is in part premised on having withdrawn from the physical life of the site and into a tier of project management, a management of intellectual and financial capital, a management of constructing and designing bodies but rarely of maintaining bodies. The labor of the makers in the first place, and the labor of their inheritors, those who maintain and govern, in the second; scrutinized, these tend to decompose the clarity of the design, to discorporate its utility as a token. In casting the work of landscape-making into the architectural model, landscape architecture reproduces a problem of architecture that becomes fatal for open sites: it assumes the persistence of the designer’s vision in a physical heap of materials. How does the design haunt the site? It appears in flashes to the sensitive. It is visible only in certain places, from certain vantage points. It exists in the motions of a certain class of visitors, taking pictures of details. 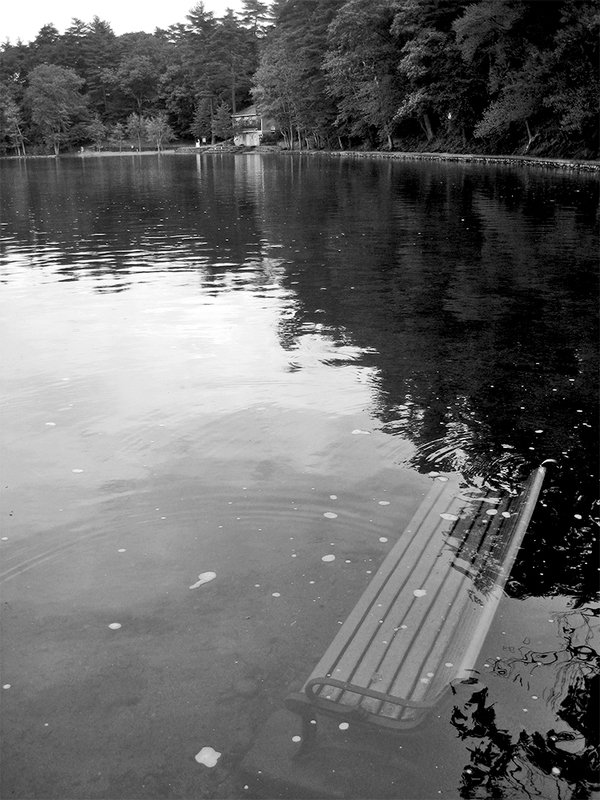 Submerged bench at Walden Pond.